WASHINGTON (CNN) -- In Sudan's Darfur region, where violence and genocide are rampant, women risk their lives every day performing tasks as seemingly mundane as seeking out firewood. 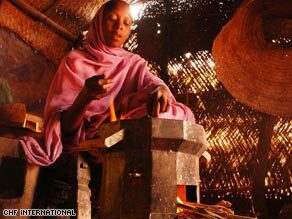 The $30 stoves help keep Darfur's women safe by reducing their time away from the refugee camps. But, from his suburban home, one Maryland teen has dedicated himself to making life a little safer for those women. The United Nations estimates that 300,000 people have been slaughtered in the ongoing violence in the north African country. Countless others have been forced out of their homes and are living in refugee camps. People living in the camps are relatively safe, but there is danger for the women and young girls who leave the compounds in search of firewood to cook meals. Firewood in the desert is scarce, and the women often have to walk up to seven hours to gather enough wood to bring back to their camps. Some women have been targeted, sexually assaulted and killed. Spencer Brodsky, 17, learned about the violence and decided to raise money to purchase fuel-efficient stoves to send to Darfur. The stoves burn 75 percent less firewood. Brodsky reasons that if he can do something to keep Sudanese women in the camps, this would decrease the likelihood of violence. Brodsky, who is Jewish, said his elders have compared the genocide in Darfur to the Holocaust. He believes that his peers should not stand for such injustice in their lifetime. "They always taught about what was happening in that region in that the social injustice that's happening. And how you know how people said during the Holocaust during World War II -- you know this can never happen again." The project is a joint effort between Brodsky and CHF International, a nonprofit organization dedicated to improving the economic conditions of people in some of the most troubled regions of the world. Naila Mohamed, leader of the stoves project at CHF International, has witnessed the reaction of Sudanese women when they receive the stoves. "These women are so grateful for this initiative and actually thankful to the American people who are so passionate to let these women know that there is help out there," Mohamed said. Together, Brodsky and CHF International want to continue raising awareness around the world of the plight of the Sudanese. No matter how old you are, you can make a difference by buying a stove, Brodsky said. "The power of one. The power of change and that we can make a difference. Even though I may be only 17 and a teenager, I can make a difference."